This game takes inspiration from the great air races of 1908 to1913 in the pioneering era of air travel. These races galvanized interest across the world, attracted participants from many counties, lured not just by thoughts of fame and adventure but also by generous prizes provided by newspapers and other sponsors. Air travel was risky and unreliable. Often only a handful of the entrants would make it to the finish line. Will one of your pilots manage to face up to the challenge? But watch out: even in this era of gentlemanly behaviour there are cads and bounders who will cheat to win. In Magnificent Flying Machines the winner is the person who ends the game with the most victory points. These can be earned in various ways including being the first to land successfully on a certain terrain tile, landing on the middle airfield, transporting cargo or passengers or performing trick manoeuvres. Simply being the first to cross the finishing line is unlikely to be enough on its own to secure a victory. 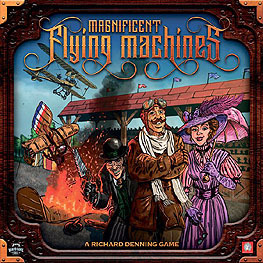 The winner will be the player who picks a strategy that best matches the abilities of the pilot and features of the flying machine they are using.